Retaining walls step up the slope of Janet and Michael Wanderman’s property. Behind the lower slab-marble retaining wall, ‘Green Velvet’ boxwoods form a hedge in front of Knock Out® roses. Oak-leaf hydrangeas have blush-and-cream blooms next to two large hornbeam trees. BACKYARD | Tufts of variegated liriope, (above) which has spikey purple blooms in late summer, form a textural and color contrast next to the ‘Winter Gem’ boxwoods. The hedge hugs the fire pit area’s seat wall. This landscaping project started with even less than a blank slate. Mitch Knapp, who led the work by his Haskell, New Jersey-based companies—Scenic Landscaping LLC, Tapestry Landscape Architecture and Tranquility Pools Inc.—says the site had hardpan clay soil, terrain angled “like a ski slope,” and brush, trees and stumps that had to be removed. 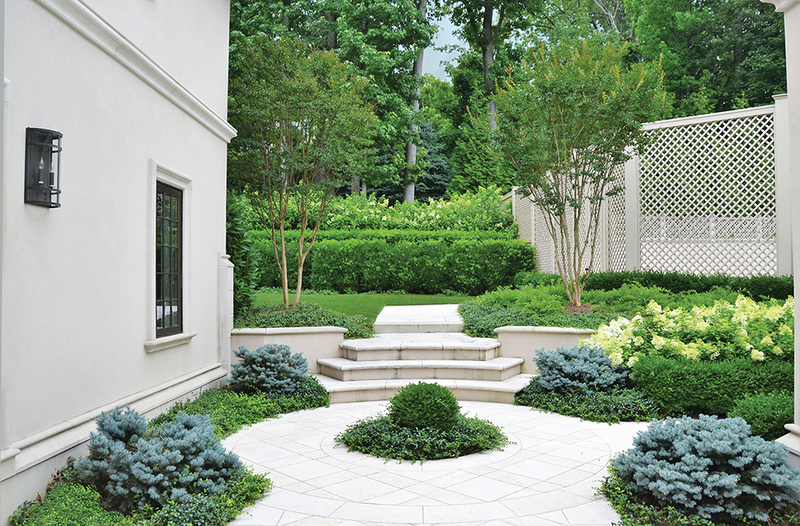 Knapp, Tapestry landscape architect Matt Jones and their team were brought aboard after homeowners Janet and Michael Wanderman purchased two adjoining lots in Tenafly, NJ and demolished existing structures. Knapp was recommended by the architect who designed the house as well as by a mutual business acquaintance. Despite those endorsements and a landscape design track record that began in 1975, Knapp needed to take the couple to see six of his past projects before they decided to hire him. ‘Green Velvet’ boxwoods edge the walkway of Turkish marble (Crema Eda is the marble’s official name; it’s also used near the pool). The blossoms of ‘Bobo’ hydrangeas and taller tree hydrangeas pop against dense green foliage. The outdoor kitchen contains (from left) a trash bin, a grill above a storage cabinet, refrigerator drawers and an ice machine. The countertop is Crema Eda marble. The backdrop is a polymer lattice fence that will last for decades, landscape designer Mitch Knapp says. COURTYARD | This courtyard, a hub leading to various entertainment zones, brims with lush land­scaping: compact ‘Globosa’ blue spruce edged with blue-blooming vinca, ‘Bobo’ hydrangeas (right), multitrunk crape myrtles (shown in June; maroon flowers open later in summer) and ‘Pinky Winky’ hydrangeas (background). FIRE PIT | A gas-fed fire pit glitters with crushed glass in the center. During chilly fall evenings, the heat source in this hangout area keeps everyone toasty. Knapp and his crews started the outdoor overhaul while the house was being built in late 2014. The Wandermans stayed involved throughout. “The wife was very into the design process, and the husband was more into the economic process,” Knapp says. “Janet went shopping with us and was picking materials. She loved it.” The garden and its amenities were largely completed by late 2015, although a few tweaks were made in spring 2016. Knapp and his team did considerable earthwork to level areas and regrade for ideal drainage. They removed the hardpan clay, which was impermeable to water, and brought in 800 yards of soil, a 50-50 mix of coarse sand and topsoil. Fertility was boosted with the addition of humus and Biotone organic plant starter from Millville, New Jersey-based Espoma, which stimulates roots. “We wanted to make the environment perfect so every plant would thrive,” Knapp says. At the front of the 54-by-21-foot pool is a retractable cover and at the back are a sun shelf and an eight-person hot tub. A pergola with limestone columns provides partial shade. It’s flanked by fastigiate sweet gum trees, which have a narrow form. “They have a nice fall presence — leaves in four different colors,” Knapp says. The resulting landscape, now 3 years old, proves his case. The property is screened from corner to corner with vigorous evergreens that were 12 to 16 feet tall when planted. From spring through fall, the garden explodes with color from dogwoods, hydrangeas, crape myrtles, vinca, ornamental grasses, sweet gum trees, Knock Out roses, blue spruce, ‘Nikko’ deutzia and variegated liriope. Throughout the April to October growing season, Knapp’s workers maintain the property with visits for routine maintenance as well as a monthly “custom garden service performed by master gardeners who hand-prune everything, add nutrients and take off dead flowers. We’re constantly in that garden,” he says. During colder months, the dormant garden is infused with color from evergreens such as cryptomeria, boxwoods, arborvitae, blue spruce and Norway spruce. 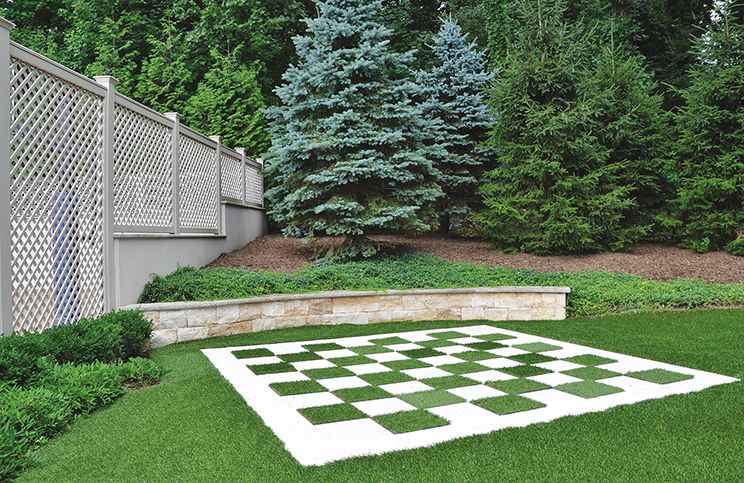 ENTERTAINMENT ZONE | In front of a slab-marble retaining wall capped with limestone is a chess area; players move large but lightweight polymer chess pieces on marble and grass squares. ENTERTAINMENT ZONE | Play areas include a ground-level trampoline with safety features built underneath. 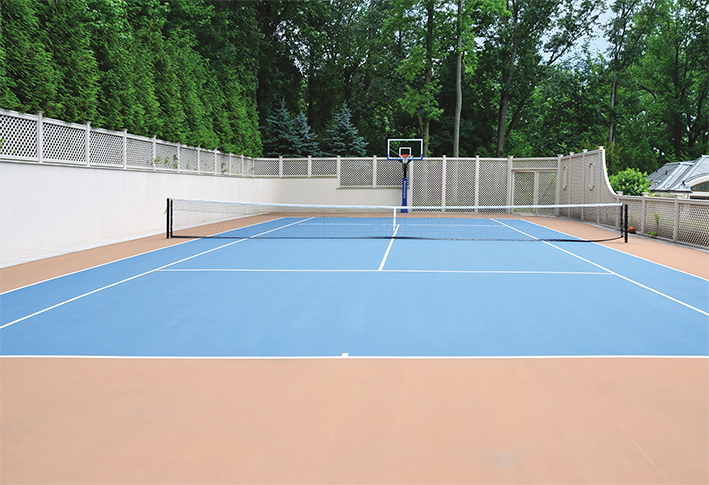 ENTERTAINMENT ZONE | The combination tennis-basektball court has a cushioned, rubbery surface. And that completes the homeowners’ wish list for a garden that’s functional, formal, colorful and private. 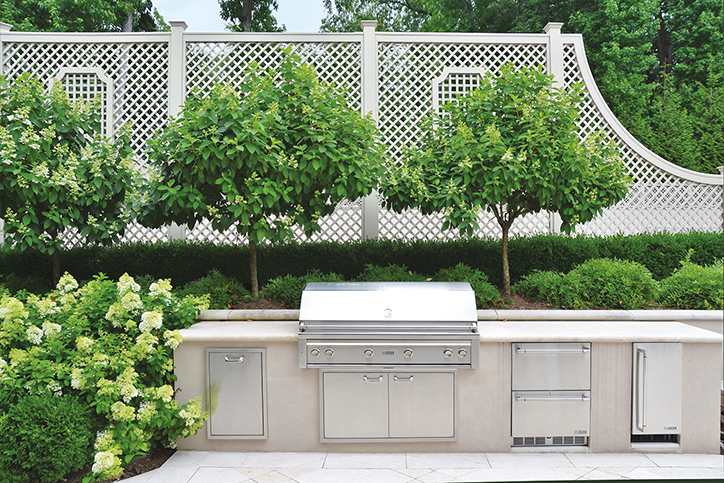 Freelancer Mary Vinnedge developed a case of landscape envy as she wrote this article. She is reviving her Galveston, Texas, garden, which was badly damaged during a January freeze.